The Sikh community has been resident in the city for over 50 years during that time, it has worked hard to integrate and contribute to the city's development. At first, the community was largely concentrated in Southampton Central, by 2001 census the community had grown to 2812 i.e. 1.3% of the population, forming the third largest religious community in Southampton. And as its members have established themselves, they have dispersed into other parts of Southampton and the surrounding areas. However, despite the dispersion Southampton has remained the main centre for the community, with the Gurdwara (Sikh Temple) serving as the hub. The importance placed on the Gurdwara cannot be under-estimated as Sikhism is fundamentally a way of life not just a religion. As such is one of only two faiths protected by legislation providing it with a special status in recognition of the fact that for Sikhs practicing their faith is inseparable from the way they live. Moreover, the Gurdwara is an integral part in this providing a place of worship, sharing, and building social cohesion through a sense of community. There are no idols, statues, or religious pictures in a Gurdwara, as the Sikhs worship only God, and regard God as having no physical form. The literal meaning of the Punjabi word Gurdwara is the residence of the Guru, or the door that leads to the Guru. The Guru is the “The Guru Granth Sahib” the Sikh holy scriptures. It is the presence of the Guru Granth Sahib that gives the Gurdwara its religious status. Everyone sits on the floor in a prayer room. Alcohol and tobacco are strictly prohibited. Throughout the world, the Gurdwara is a place of immense importance for the adherents of the Sikh faith where all are welcomed. First and foremost, it is what its founder Guru Nanak Dev Ji intended it to be and so named it: the doorway to the enlightener. The Gurdwara serves as the provider and facilitator for quenching the thirst of the mortal to understand his/her world, his/her place in it and his/her relation to the creator. The Gurdwara is the great equalizer: all who come to hear the message of the holy scriptures of the Sikhs are respected and treated as equal to another, no matter what their religion, race, colour, origin. Significantly, men and women are also treated as equals. The Gurdwara serves as an oasis of divine knowledge for people of all origins and of all faiths, and even those who have no faith. It is a place, which acts as a focal point for Sikh religious celebrations and customs. Another important part of the Gurdwara service is the free community meal “Langar” where the rich and the poor sit together and eat as equals. Imparting our religious and cultural heritage to the youth has been important priority. We have been teaching the children Sikh history, Panjabi language (our ancestral mother tongue), Kirtan (singing praises of the almighty) using Harmonium (small piano) and Tabla (pair of small drums) during the week and Sunday classes and also encouraging them to participate in multi-cultural or inter-faith events. The children are learning to conduct themselves according to the tenets of the faith. We place strong emphasis on leading our lives according to the teachings of the Gurus and intend to pass on these values and traditions to the younger generation, who will be part of the great of the local and national community. Today the Sikh community plays an active role in the local community and has presence in all aspects of Southampton life including politics, the police, human rights campaigns, sports, education and the law. Currently, there are ongoing issues of certain of under-representation in some sectors of employment, which can be partly addressed by appropriate awareness of Sikhs and Sikhism. This has been an on-going challenge for Sikhs, both historically and today. Over 300 years after Guru Gobind Singh Ji declared these outwardly visible symbols to be carried by all practicing Sikhs, some members of the Sikh religion still face discrimination as a result of wanting to follow these tenets of their faith. 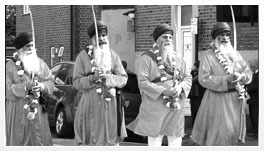 Especially in the aftermath of 11 September 2001 attacks in the USA, reported crime figures of verbal and physical attacks on Sikhs wearing beards and turbans has seen as increase. It is thought many of these were because people mistook Sikhs for Muslims. Despite this, the Sikh community has continued to contribute to the multicultural life in Southampton.